Understanding how RNA binding proteins control the genetic splicing code is fundamental to human biology and disease – much like editing film can change a movie scene. Abnormal variations in splicing are often implicated in cancer and genetic neurodegenerative disorders. In a step toward deciphering the “splicing code” of the human genome, researchers at the University of California, San Diego School of Medicine have comprehensively analyzed six of the more highly expressed RNA binding proteins collectively known as heterogeneous nuclear ribonucleoparticle (hnRNP) proteins. This study, published online Feb 16 in Cell Press’ new open-access journal Cell Reports, describes how multiple RNA binding proteins cooperatively control the diversity of proteins in human cells by regulating the alternative splicing of thousands of genes. In the splicing process, fragments that do not typically code for protein, called introns, are removed from gene transcripts, and the remaining sequences, called exons, are reconnected. 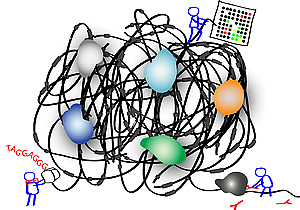 The proteins that bind to RNA are important for the control of the splicing process, and the location where they bind dictates which pieces of the RNA are included or excluded in the final gene transcript — in much the same fashion that removing and inserting scenes, or splicing, can alter the plot of a movie. The data sets highlighted in this study – derived from genome-wide methods including custom-designed splicing-sensitive microarrays, RNA sequencing and high-throughput sequencing to identify genome-wide binding sites (CLIP-seq) — map the functional binding sites for six of the major hnRNP proteins in human cells. “We identified thousands of binding sites and altered splicing events for these hnRNP proteins and discovered that, surprisingly these proteins bind and regulate each other and a whole network of other RNA binding proteins, suggesting that these proteins are important for the homeostasis of the cell,” said first author, NSF fellow Stephanie C. Huelga. According to the UCSD researchers, the genes specifically targeted by the RNA binding proteins in this study are also often implicated in cancer. Yeo added that of the thousands of genomic mutations that appear in cancer, a vast majority occur in the introns that are removed during splicing; however, intronic regions are where regulatory hnRNP proteins often bind. Additional contributors to the study include Anthony Q. Vu, Justin D. Arnold, Tiffany Y. Liang, Patrick P. Liu and Bernice Y. Yan, UCSD Cellular and Molecular Medicine; John Paul Donohue, Lily Shiue and Manuel Ares, Jr., UC Santa Cruz; Shawn Hoon and Sydney Brenner, A*STAR, Singapore. The study was funded in part by grants from the National Institutes of Health and the UC San Diego Stem Cell Research Program.